A statement hit national headlines this Thursday and echoed all around the world: the vote of the black woman saved Alabama (and the entire country). The exit polls reported 92% of the black female vote in favor of the Democratic candidate Doug Jones, this being the most significant stratum in every survey. And it is not surprising considering that, since the nineteenth century, the African-American woman has been not only the population most affected by national policies but also the most audible voice in the struggle for its rights. International media such as The Guardian are reminiscent of emblematic figures in the struggle for civil rights such as Sojourner Truth (abolitionist born in slavery), Ida B Wells-Barnett (academic and first leader of the Civil Rights Movement) and Mary McLeod Bethune (educator and founder of the first private school for African-American students), names that this writer admits with regret not knowing, as surely happens to the great majority in the country. This historical omission, conjugated with the national women's empowerment movement that has revolutionized the status quo of American patriarchy (yes, we talk again about #MeToo, and we will continue talking about it as necessary), created the definitive change for a state like Alabama, who many condemned to a historical and retrograde fixation, as if it were a parallel dimension. And it's not just a matter of gender since 63% of white women voted for Roy Moore, the Republican candidate accused of pedophilia and whose extremist campaign has annulled the colored community for years and has boosted the deep-rootedness of the nation’s worst historical ghosts. "There’s no state in America where black people recognize the horrors of turning back the clock more than the state of Alabama," said Bryan Stevenson, founder of the Equal Justice Initiative to the New York Times. "There is a consciousness about this history in the African-American community." Considering that the black community has the highest poverty rate in the country (according to the Pew Research Center), it is not surprising that given Trump’s threats to cut government aid programs, this community pounced to change the course of things. Similarly, and especially considering the president's attitudes toward obviously racist events such as Charlottesville, the African-American community in Alabama said "enough" to the resurgence of politically-legitimized racism. The Democratic Party joined this revolutionary ship, giving millions of dollars to grass-roots programs to support Jones, but the African-American woman did not push the wind of change to remain relegated to being support troops when needed. 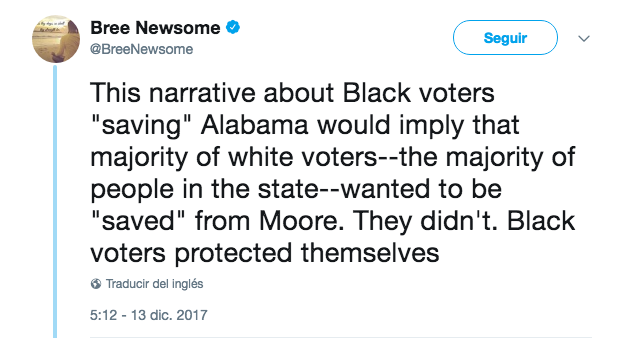 Activist Bree Newsome wrote on Twitter: "This narrative about Black voters 'saving' Alabama would imply that the majority of white voters - the majority of people in the state - wanted to be 'saved' from Moore. They didn't. Black voters protected themselves”. This is the moment, then, not only to recognize the misogyny and racism prevailing in American society but also to identify that the so-called "minorities" are those who hold the destiny of the entire nation in their hands.